The Tooth Fairy is thought to be strictly nocturnal, making her rounds while kids are asleep and leaving them a token in exchange for the baby teeth they leave for her under their pillows. But she made a rare public appearance in broad daylight Thursday at Capitol View Elementary School to help kids take proper care of the teeth that replace the ones she collects. 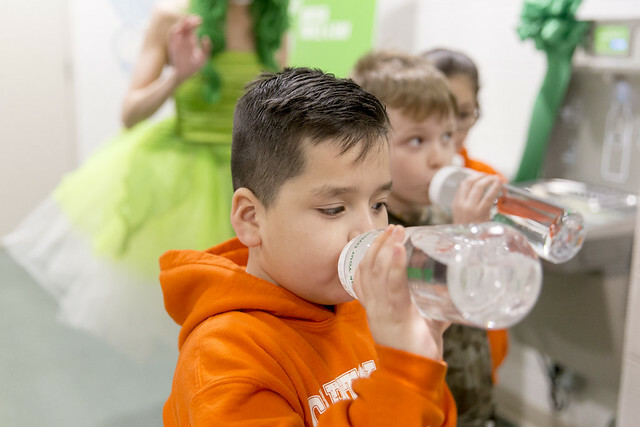 Delta Dental of Iowa, in partnership with the Iowa Department of Education and Iowa Department of Public Health, has granted $230,000 in water bottle filling stations to Iowa schools. More than 170 schools applied for this grant and 54 were selected. Thirteen of the grantees are DMPS schools. In addition to the filling stations, the Rethink Your Drink initiative includes an oral health educational component. Despite efforts by families, schools and public health agencies, children and teenagers often choose sugary caffeinated beverages, sports drinks and energy drinks. Fluoridated water keeps students and staff more alert, better hydrated, protects tooth enamel, and makes teeth more resistant to cavities. Since Capitol View’s filling station was installed a couple of weeks ago, students and staff have used it almost 600 times already, according to the odometer its equipped with. And that was before everyone in the building was given their own water bottle (and toothbrush). Those gifts came along with the Tooth Fairy’s appearance. When she, Russell, Dr. Bob Russell (IDPH’s chief dentist), and Capitol View Dean of Students David Sharkey made their rounds of classrooms to pass out the swag, one kindergartener wiggled a loose tooth at her. Sorry, no payments in advance. DMPS Director of Food & Nutrition Amanda Miller coordinated the district’s participation in Rethink Your Drink in collaboration with Grant Writing Specialist Lori Brenno. Miller was on hand at Capitol View to thank Delta Dental.